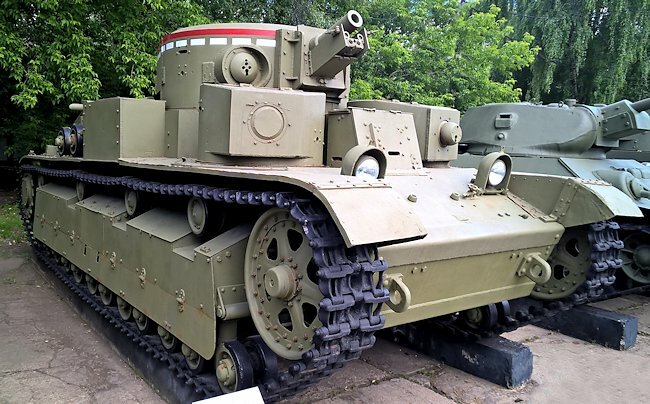 The Soviet WW2 T-28 Medium Tank with three turrets. Its main gun is a mid-production 76.2mm KT-28 cannon. 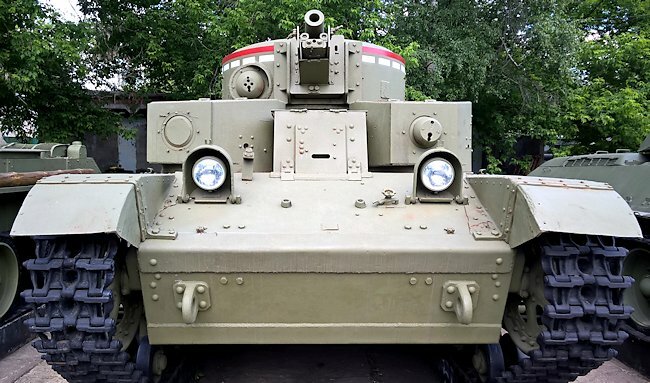 The T-28 Soviet medium tank was armed with a 76.2 millimetre KT-28 Cannon fitted to the top turret. Only 500 T-28 tanks were produced between 1932 in 1941. It had a bigger heavyweight brother called the T-35 that had an additional two turrets on the rear deck making a total of five. Each of the two front hull mounted turrets were equipped with a 7.62 millimetre DT machine gun. A third 7.62 millimetre DT machine gun was fitted at the rear of the main turret and the fourth to the front of the turret just to the right of the main gun. Some of the later versions had a fifth 7.62 mm machine-gun fitted on a metal arm by the commander's copula for use against attacking aircraft. 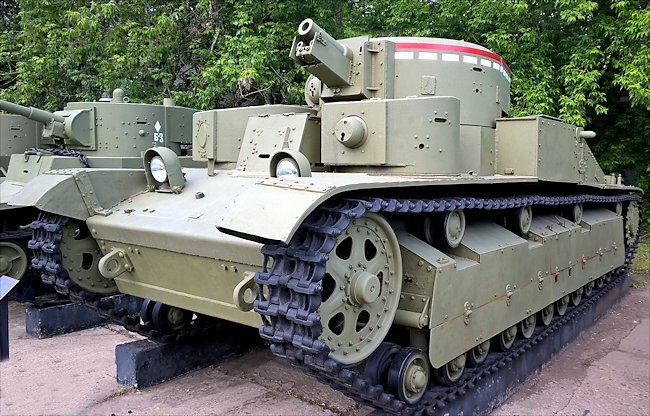 The Soviet T-28 medium tank was powered by a Mikulin M-17 V12 engine that produced 500bhp. It's top road speed was 37 km/h (23mph). It an operational range of 220 kilometres (140 miles). Its armour initially ranged from 20 to 30 millimetres. this was later upgraded. 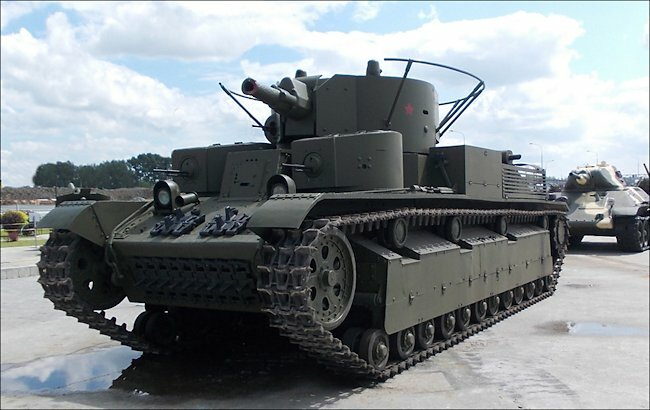 Both the T28 and T35 Russian tank designs were inspired by the British Vickers A1E1 Independent tank prototype. In between the two world wars Russian army officers visited England. Their concern that their major enemy at the time, Poland was rearming. They had received reports that the Polish army was being equipped with French and British designed tanks. Russia purchased a few Vickers-Armstrong E tanks and license their production in Russian factories. 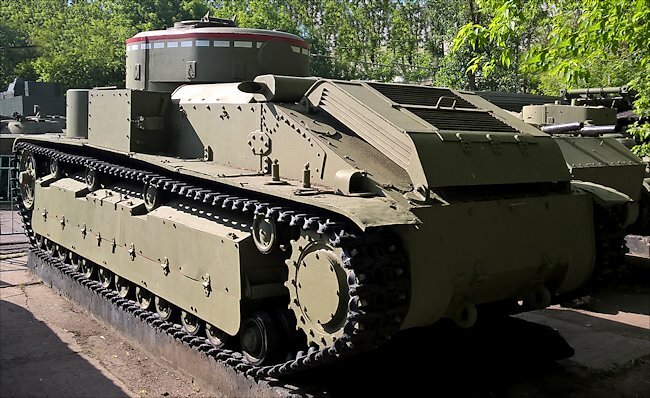 These finished Russian-made tanks became known as the T-26 and along with the BT-7 light tank became the mainstay of the Russian army in 1941 when the Germans invaded. The heavier armed T-28 and T-35 tanks provided support for the infantry and the light tanks. With a secret nonaggression pact signed with Germany the Soviet army invaded Poland in 1939 and used its T-28 tanks in action for the first time. They were later used in the winter war of 1939 against Finland. Finnish troops found that they could knock out the T-28 tanks with anti-tank guns so the Russian army quickly upgraded the front armour plates 80 millimetre in thickness and 40 millimetre on the side. With this extra protection some of the upgraded T-28 tanks were able to break through the finish Mannerheim defensive line. A few T-28's were captured by the Finnish army. Some have been knocked out by enemy action and others were destroyed by the tank crews had to abandon them due to mechanical defects, lack of fuel or ammunition. When the German army invaded in June 1941 as part of operation Barbarossa, the Russian army only had 41 T-28 tanks left. Most of these were lost during the first two months of combat. Some were reportedly used in the defence of Leningrad (St Petersburg) and Moscow. By 1942 they were considered obsolete and were rarely found in the front line. When it was introduced service in 1933 it was a very advanced tank. The British, German and French army had nothing that could touch it. The T-28 tanks that had received the armour upgrade were on par with the German early Panzer IV tanks, but the T-28 tank design had reached the end of its operational upgrade path. It had poor outdated suspension and was soon outclassed in performance by the new T34/76 medium tank. Production was stopped and resources diverted to manufacturing the latest Soviet tank models. Where can I find preserved T-28 tanks?